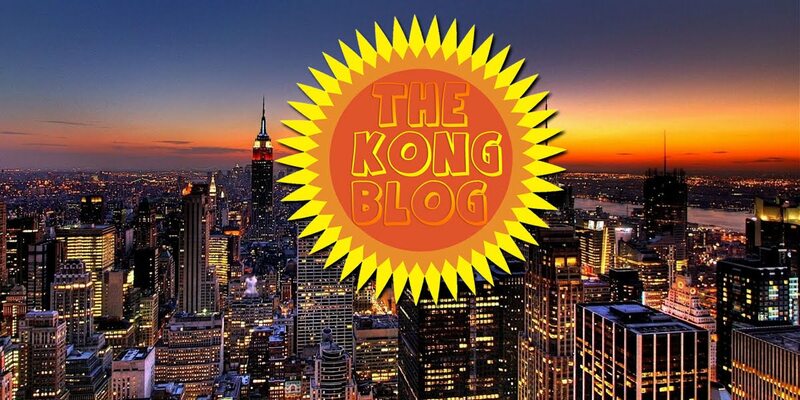 Besides a few brief stints of freedom, notorious British criminal and troublemaker Charles Salvador (better known as Charles Bronson) has been serving time since 1974. During these decades behind bars, and often confined to isolation, Bronson has become a fitness fanatic, creating workout programs that require only his bodyweight and a few odd objects. His extreme regimen has given him near-superhuman strength — he claims to be able to do 172 push-ups in 60 seconds, pick up a pool table by himself, and bend a steel prison cell door with his bare hands. He’s set many prison fitness records as well, including one for most push-ups in an hour: 1,727. But Bronson is hardly the only inmate who’s managed to gain impressive strength without access to barbells, nutritious food, or supplements. 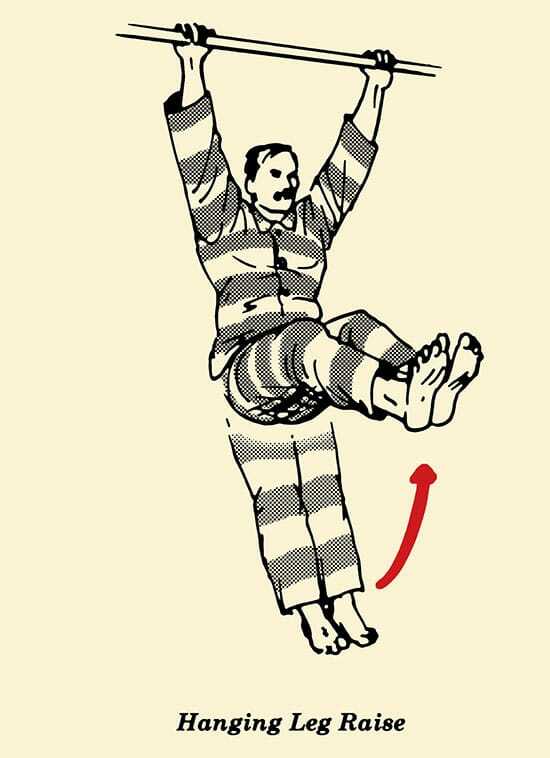 Prisoners all over the world have created highly effective strength-building routines they can perform in the tiny space of their cell or with limited equipment in the jail yard. For men who are locked up, being strong and looking strong isn’t just about aesthetics and personal development; the appearance of size and prowess acts as a deterrent to attack and can be necessary for survival. While most of us will thankfully never end up behind bars, I think we can all take a lesson from convicts on how to not let your circumstances be an excuse for your fitness goals. Below we highlight bodyweight exercises used by prisoners the world over to get strong and stay strong. You can do them anywhere. Don’t have time to make it to the gym? Travel a lot? Locked up for 5-10 years? Great! You can do the prisoner workout anywhere…bedroom, office, hotel room, or solitary confinement. It’s free. Don’t have the money for a gym membership or purchasing your own equipment? That’s not an excuse for not exercising. With a few simple bodyweight exercises, you can create a full-body workout that’s completely free. Strength+cardio in a single workout. By increasing the tempo and decreasing the rest between sets and exercises, you can turn a bodyweight workout into both a high-intensity cardio session and a strength workout. In 30 minutes, you’ll be done with your exercise for the day. Below I’ve highlighted six main bodyweight exercises that work the entire body. However, with a little tweaking of each exercise, you can create over 50 different exercises from just these six basic movements. If you’re locked up for life, I’m sure you could come up with another 50 variations. According to the book he wrote in prison, Solitary Fitness, Bronson performs 2,000 push-ups a day. If you start doing 10 push-ups a day and add 5 more each day, in a little over a year, you can get up to that level. The push-up works multiple muscle groups including the chest, anterior deltoid, and triceps. And the great thing about it is that the exercise can be easily modified to increase difficultly and work different muscle groups. Narrow/Wide Hand Placement. By simply adjusting the placement of your hands, you can emphasize different muscle groups. Narrow hand placement works the triceps, while a wider hand placement emphasizes the pecs. Hindu Push-up. This is a dynamic full-body movement that will build strength and flexibility in your chest, shoulders, back, hips, and triceps. Handstand Push-up. Forget shoulder presses. If you want a killer shoulder workout, look no further than the handstand push-up. To perform the handstand push-up, assume a handstand position. Slowly bend your elbows and lower your inverted body towards the ground. In order to maintain balance, you’re going to have to call on your core and other smaller stabilizing muscles. If you can’t do a stand-alone handstand, use a wall to assist you. One-Armed Push-up. 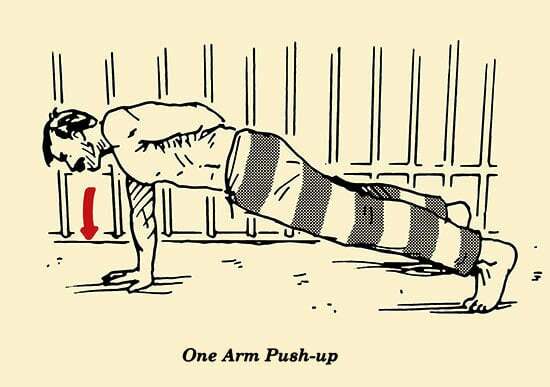 You’ll have achieved top-dog, alpha-male-prisoner, beast-mode status when you can perform multiple one-handed push-ups. Mixed Grip Pull-up. One hand grips the bar overhand and the other underhand. Commando Pull-up. 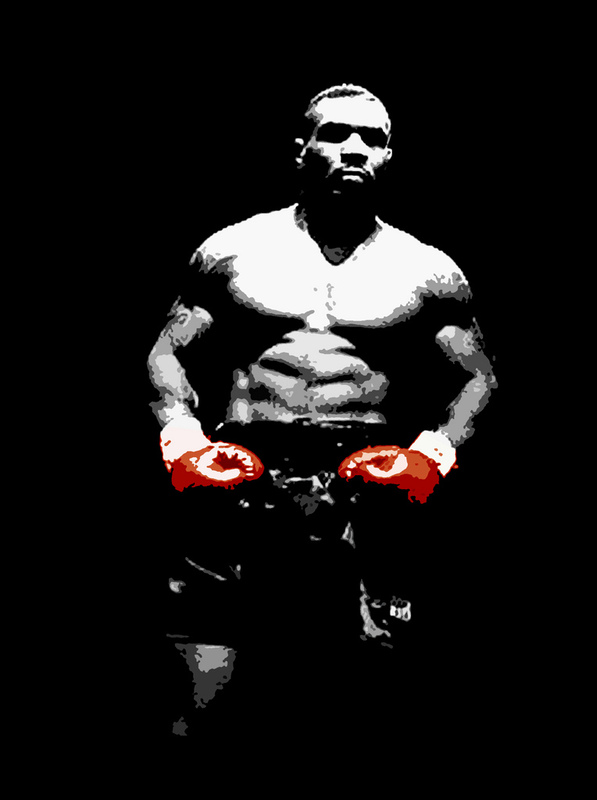 You may remember Rocky doing these babies during his epic training montage. Take an underhand grip with one hand and an overhand grip with the other. Pull your head to one side of the bar for one rep, and then to the other side of the bar on the next rep.
Towel Pull-ups. Hang two towels from your bar and grip one in each hand. Pull yourself up. Great for grip strength. If you can’t do more than one stinking pull-up, see our “do more than one pull-up” workout. It’ll have you cranking out pull-ups for reps in no time. The squat is one of the most basic yet effective athletic movements. In just one exercise, you work your quads, hamstrings, glutes, hips, and inner thighs. Prisoner Squat. The traditional prisoner bodyweight squat is performed by placing your hands behind your head. Squat down until your thighs are below parallel. 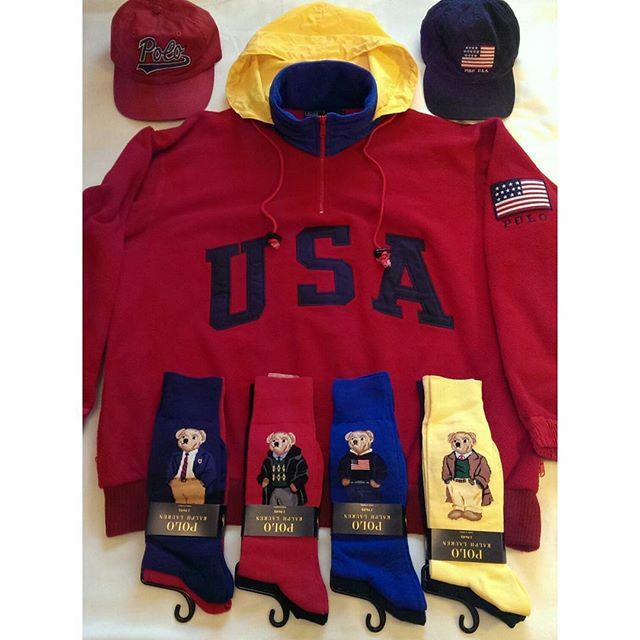 Come up. That’s one rep.
Add Weight. While you might not have access to a barbell, you can find odd objects in your environment that you can hoist up on your shoulders or hold in front of your chest. Once you’ve got your desired weight, simply squat. Squat Jumps. A plyometric version of the squat to build explosiveness. 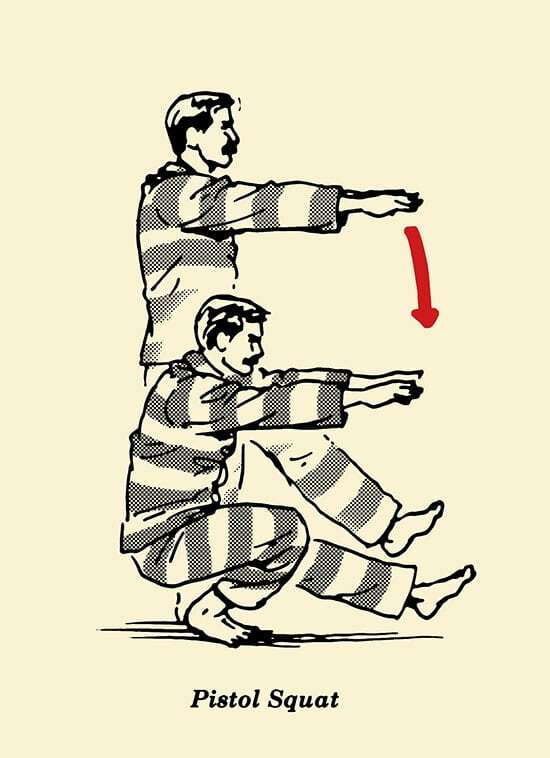 Perform a prisoner squat as you normally would, but when you reach the bottom of the squat explode up and jump off the ground as high as you can. When your feet are back on the ground, immediately sink into another squat and jump again. Great for HIIT. Pistol Squat. You’ll have achieved top-dog, alpha-male-prisoner, beast-mode status when you can perform multiple pistol squats. A pistol squat is a one-legged full squat. The leg that you’re not squatting with sticks out right in front of you when you’re in the squat position. When you’re at the bottom of the squat, you sort of look like a pistol, hence the name. It’s a beast to do and will take months to work up to. There are entire routines to help you accomplish this Herculean feat (and perhaps we’ll hit on it in the future), but one of the best exercises to help you segue into a pistol squat is to perform the assisted variety. Simply grab a pole or some other sturdy object in front of you and lower yourself into a one-legged squat position and use the pole to help pull yourself up. Eventually, you can take off these training wheels and do a free-standing one. Dips work the triceps, pecs, shoulders, forearms, and core, and you don’t need a fancy dip rig to do them. 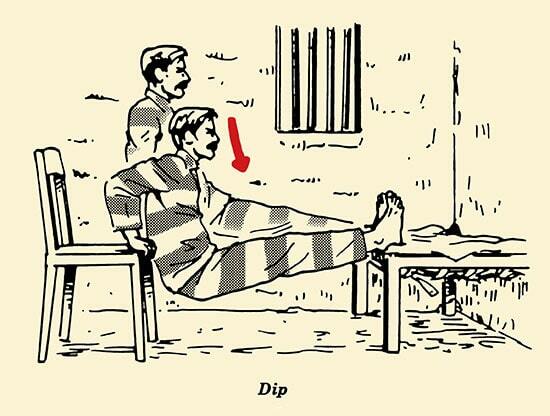 Prisoners will put their hands on a chair with their feet on the floor or propped up on the bed. You can make them more difficult by placing weighted objects in your lap. This is a core blaster. Not only does it hit the abs, obliques, and rib muscles, but it also works your quads, hips, forearms, and shoulder muscles. Straight Leg Raises. Grab and hang from a bar with a slightly wider than shoulder-width overhand grip. Keeping your knees straight, raise legs by flexing hips until they are completely flexed, or knees are well above hips. Return until hips are extended downward. Bent Knee Leg Raises. If you can’t do a straight leg raise, you can modify it by bending your knees and raising them into your chest. Full Straight Leg Raise. Perform a straight leg raise as you normally would, but instead of stopping when your feet rise above your hips, keep going until your toes touch the bar. Towel Straight Leg Raises. Place two towels over the bar and grip one in each hand. Perform a straight leg raise while holding onto the towels. Hanging Windshield Wiper. Perform a straight leg raise, but when your feet come to the top positions, brace your abs and rotate your legs to one side as far as you can. Rotate to the other side. That’s one rep.
One-Arm Straight Leg Raise. 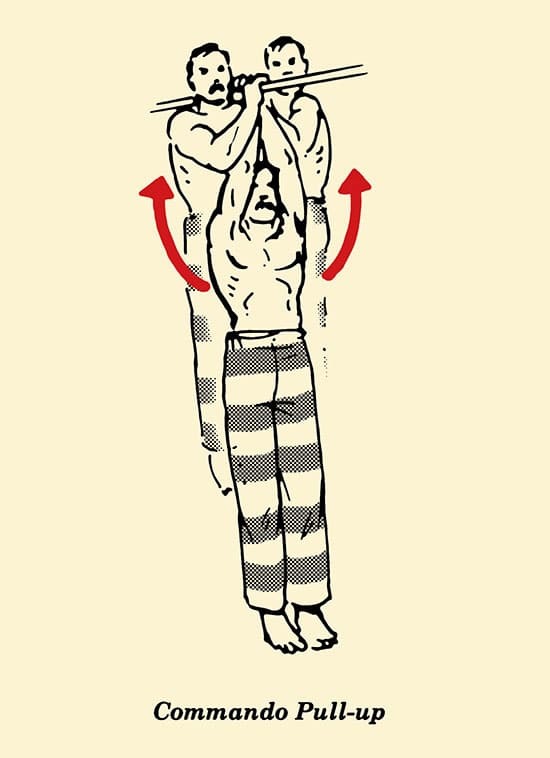 You’ll have achieved top-dog, alpha-male-prisoner, beast-mode status when you can perform multiple one-armed straight leg raises and hold yourself in the top position for several seconds. The burpee is the ultimate full-body exercise. There’s a reason football teams, CrossFit practitioners, and elite military forces use the burpee in their workouts. Just one simple movement tests both your strength and aerobic capacities. Burpee With Hindu Push-up. 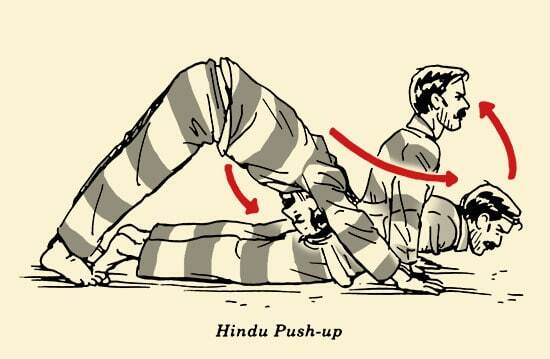 Instead of just doing a full push-up, make it a Hindu push-up. As you can see above, you’ve got a lot of choices when it comes to exercises to create a bodyweight workout. Mix and match the exercises to your liking along with a set and rep scheme to create your bodyweight workout. This is supposedly a favorite workout routine amongst prisoners because they usually have a deck of cards handy. Start drawing cards from the top. The suit tells you what exercise you’re doing; the number tells you the reps. Face cards count as ten rep; aces 11. So if you drew the 5 of diamonds you would do five squats; if you drew the king of clubs, you do ten push-ups. Draw the cards and perform the corresponding exercise and reps until all the cards have been drawn. According to the book Jailhouse Strong, the convicts inside Mexico’s Juarez Valley Prison — one of the world’s most dangerous prisons — use the following rep scheme for their bodyweight workout. Pick an exercise. You’re only going to be doing one during this circuit. Let’s say for this example, you’re going to do push-ups. So on the odd sets, you’re starting from 20 reps, going down a rep every odd set, and on the even sets, you’re starting from 1 rep and going up a rep every even set. When it’s all said and done, you’ll have completed 210 reps. Between each set, walk 5-10 steps for a rest and then get back into it. The goal is to complete this circuit as fast as you can. Line up ten cards facedown in a straight line on the ground with 4″ in-between each card. Begin by standing over the first card, squat down and pick up the first card. Holding the first card, take a step forward to the second card. Squat down and place the card you just picked up on top of the second card. At this point, you’ll have no cards in your hand, and 2 cards will be one on top of the other on the ground below you. Squat once and pick up the first card. Squat once and pick up the second card. Take a step forward to the third card, squat down, and place one of the two cards in your hand on top of the card on the ground. Now squat down and place the other card on top of the cards on the ground. Squat one time each to pick up the three cards one by one. Take a step forward to the fourth card, and repeat this process until you’ve made it through all ten cards. Instead of having a set time period where you try to crank out as many reps as you can, with greasing the groove, you’re performing reps throughout the day. You might set up a system where every half hour, you perform ten push-ups. Assuming you’re up for 12 hours a day, that’s 240 push-ups every day. I do greasing the groove with pull-ups. I’ve got a pull-up bar hung up in my closet’s doorframe. Anytime I walk by it, I crank out five pull-ups. The number of pull-up reps I’m able to accumulate during the day always surprises me. For hypertrophy and endurance, simply do one set of each exercise for as many reps as you can.